When Persia initiated to recover from the Mongol destruction of the 13th century and Timur’s invasion of the14th century , Taliq ( changing script ) and its derivative Nastaliq appeared . Taliq comes up to have been formalized in the13th century , although it existed from earlier scripts for many centuries before this and was claimed to be derived from the old script of pre – Islamic Sasanian Persia . 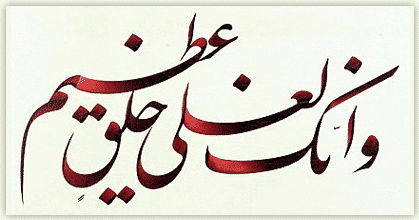 Taliq was written with a wide reed pen obliquely cut and looks quite unlike previous scripts . Generally it is the combination off short slim verticals with wide horizontals whose normal length is exaggerated whenever possible , particularly at the end of words . In the 14th century Mir Ali Tabrizi developed Nastaliq from Taliq form .it was a flexible style ,which was used thoroughly in copying romantic and poetry . Mir Ali is said to have dreamed of a flight of geese whose wings and movement inspired the patterns of letters , Numerous copies of Persian literary manuscripts , among them the famous version of Ferdawsi’s Shahnamah, were released at Timurid court. Nastaliq has always been more common in the Persian , Turkic , and South Asian spheres of impact . Nastaʿlīq has widely been ( and still is ) practiced in Iran , Pakistan as well as Afghanistan for written poetry and as a type of art . Nevertheless , it is even harder to read than Naskh.